Graham wanted to design an eternity ring for Katrina for her birthday. 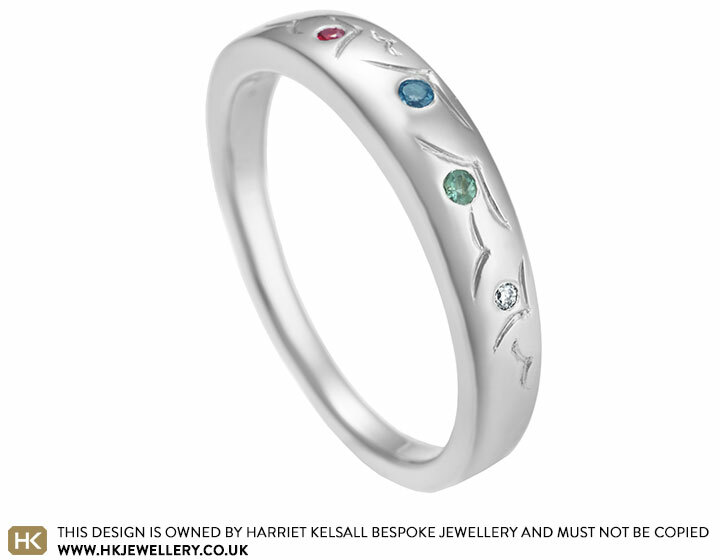 He loved the idea of having bird inspired engraving, but also incorporating their family's birthstones in to the ring. After surprising Katrina on her birthday with the idea, they both came in to the studio to design the ring together. Katrina loved the idea of bird inspired engraving so decided to have this featured across the top of her ring, with a minimalist artistic impression of birds flying. Katrina also liked Graham's idea of having their family's birthstones in the eternity ring and so they decided to have their birthstones slightly bigger in size than their children's, to symbolise their family. They went for a 1.5mm green Alexandrite, a 1.5mm blue topaz, a 1.2mm ruby and a 1.2mm H Si diamond. 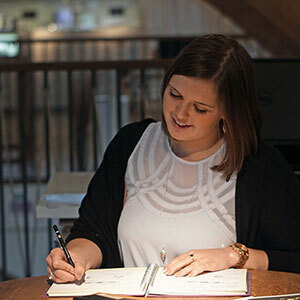 Katrina thought that the band should deepen towards the top of her finger as she felt it suited her finger shape better and also matched the deepening in her engagement and wedding ring set. So the ring was wider at the front to make the most of her engraving and gemstones, but then tapering to a slimmer more delicate width at the back. The ring was polished to a high shine.